There are only two LEGOLAND theme park locations in the U.S., so it’s natural for families to make comparisons. 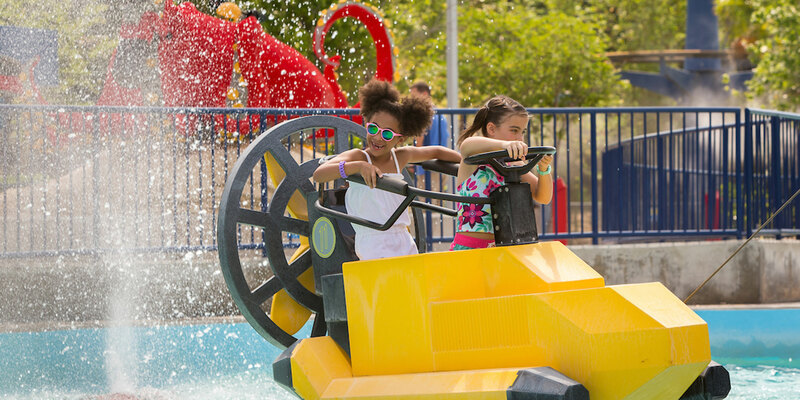 These are our main observations for LEGOLAND Florida vs. LEGOLAND California — see what’s different and the same at both parks. LEGOLAND excels in catering to the pre-school set. In both Florida and California, DUPLO Village is an entire section dedicated to children ages 5 and younger, with indoor and outdoor play spaces. There are several playgrounds and hands-on areas throughout these parks, where LEGO pieces are available for recharging moments of creative play. Both have Baby Care Centers, stroller rentals, and healthy food options. 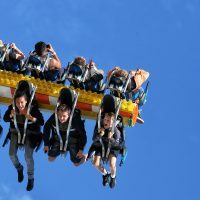 You’ll find several rides and attractions unique to LEGOLAND, and both of these parks include the popular Lost Kingdom Adventure with interactive target shooting with laser guns, the Aqua Zone Wave Racers, Royal Joust, Beetle Bounce and the Coastersaurus, Dragon, and LEGO Technic coasters. Both have driving schools — sponsored by Ford in Florida and Volvo in California — where kids drive their own cars freely through simulated streets. In 2016, LEGOLAND California debuted NINJAGO the Ride, and in 2017, LEGOLAND Florida will do the same, bringing with it a new section of the park dedicated to the LEGO NINJAGO: Masters of Spinjitzu TV series. The highlight of any LEGOLAND is this section with several large-scale LEGO replicas of major cities, recreated in amazing, artistic detail with interactive elements like water features, sound, moving pieces and vehicles. In California, part of the experience is a boat ride to view them from the water. The Florida section — originally constructed for Carlsbad — was moved to Winter Haven and replaced with a Star Wars vignette. 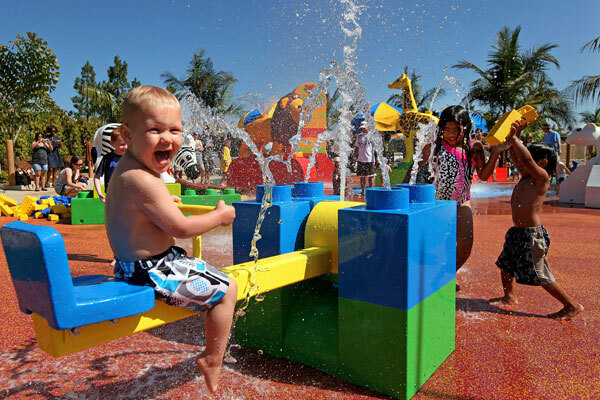 The world’s first LEGOLAND Water Park was in Carlsbad. Four waterslides emerge from the center attraction, a 45-foot tower, which looks like it was built from oversized LEGO pieces. 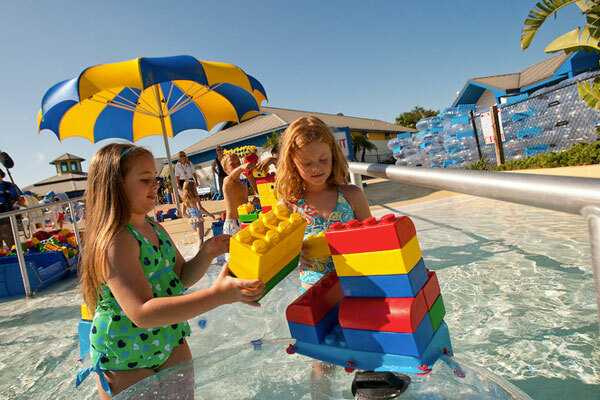 Build-a-Raft River, DUPLO Splash Safari, Orange Rush and Joker Soaker are attractions meant to get you wet. LEGOLAND Florida added a water park in the former Cypress Gardens. It features pretty much the same attractions as in Carlsbad, along with a wave pool. LEGOLAND Florida, at 150 acres, is the world’s largest LEGOLAND. It includes the expansive former Cypress Gardens attraction. There is just too much to do and see in one day, especially in the “off-season” months when it may only be open for seven hours. We found that the California park was doable in one full day (though the kids will obviously want to stay longer). At LEGOLAND California, you’ll find a SEA LIFE Aquarium adjacent to the park. Admission requires an upgraded ticket fee. You’ll discover 200 species of marine life in exhibits which include the Octopus Garden, a Ray Lagoon, Kingdom of the Seahorse, and Discovery Zone Touch Pool. Amusingly, several incorporate LEGO sculpture, including the divers exploring the Lost City of Atlantis. In Winter Haven, LEGOLAND purchased the land of what was once the Cypress Gardens attraction, and restored the lush gardens with species from around the world, as well as the cove for water ski shows. Today’s version tells the story of Brickbeard the Pirate, and features impressive water ski stunts. Also remaining is the Island in the Sky ride, a revolving disk, which rises to 150 feet to offer 360-degree views of the entire park and Lake Eloise. It’s incorporated within the park, so there isn’t an extra admission fee. If you love LEGO, you’ll love both of these parks. 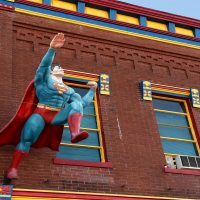 While you’ll find much in common as you stroll through the Land of Adventure, Fun Town, and the Imagination Zone, you will also experience unique rides, attractions, shops and eateries that make it worthwhile to visit both. Both LEGOLAND parks in California and Florida operate adjoining LEGO-themed hotels. The LEGOLAND California Hotel opened in 2003 with 250 rooms, while the LEGOLAND Florida Hotel opened in May 2015 with 152 suites. Both hotels offered family rooms with bunks and other features for kids; onsite dining that includes mini-buffets for kids; onsite activities including shows; and best of all, early entrance to the parks, one hour before the general public can enter.